Sixty years ago, a full six months after British rule had come to an end in India, the Nizam of Hyderabad, then the richest man in the world, was still refusing to sign up to join the new Indian Union. Sir Osman Ali Khan firmly believed that there was no reason why Hyderabad should be forced to join either India or Pakistan. His state had income and expenditure equal to Belgium, and exceeded that of 20 member-states of the United Nations. His personal fortune was more remarkable still: according to one contemporary estimate, it amounted to at least £100 million in gold and silver bullion, and £400 million in jewels. He also owned one of the world's great art collections. For over three centuries, the Nizam's ancestors had ruled a state the size of Italy and could claim the allegiance of some 15 million subjects. Nor was his reputation limited just to India: during the years leading up to World War II, the Nizam was also regarded by many as the leading Muslim ruler in the world. A few years earlier, in 1921, the Nizam's two sons had been sent to Nice where they married the daughter and the niece of the last Caliph of Turkey, Abdul Majid II. As part of the marriage arrangements, the Caliph had nominated the Nizam's son as heir to the Caliphate, so uniting the supreme spiritual authority of the Muslim world with its greatest concentration of riches. The dynasty seemed unassailable. 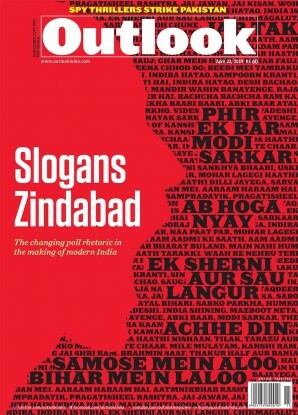 The disintegration of the state of Hyderabad and the dispersal of the wealth of its Nizams is one of 20th century's most dramatic reversals of fortunes. Mukarram Jah, who succeeded his grandfather Osman Ali Khan in February 1967, quickly found himself enmeshed in financial chaos. He had inherited a ridiculously inflated army of retainers: 14,718 staff and dependents, including no less than 42 of his grandfather's concubines and their 100-plus offspring. The Chowmahalla palace complex alone had 6,000 employees; there were around 3,000 Arab bodyguards and 38 people whose only job was to dust the chandeliers; several others were retained specifically to grind the Nizam's walnuts. For all the rococo Once - Upon - A - Time - There - Was - A - Princess - Who - Lived - In - A -Huge - Palace quality of the Nizam's world, by 1967, everything was in a state of severe disarray: the Nizam's garages, for example, cost £45,000 a year to keep in petrol and spare parts for 60 cars, yet only four vehicles were in working condition, and the limousine supposed to take the Nizam from his coronation broke down on the way to the reception. Most debilitating of all was the legal wrangling initiated by the several thousand descendants of the different Nizams who claimed part of Jah's inheritance: by 1973, 476 legal heirs of the sixth Nizam and 1,945 descendants of the fifth had filed suits or claims of various sorts. Even getting the smallest sum to live on proved difficult for the new Nizam: his vast inheritance had been distributed between 54 different trusts, the control of which were disputed. So, despite nominally inheriting one of the world's greatest fortunes, he was forced to sell jewellery and other family heirlooms to keep solvent. Eventually, in 1973, frustrated and disgusted by the weight of litigation and the bitterness of the family infighting, Jah took off from Hyderabad, and relocated to a sheep farm in Perth, Australia. There, His Exalted Highness spent his days tinkering under the bonnets of his cars, or driving bulldozers and heavy earth-moving equipment around the Australian bush. In his absence, Jah's unsupervised Hyderabad properties were looted and his possessions dispersed by a succession of incompetent or dishonest advisors. Many palaces were sealed by orders of different courts. Those which weren't were quietly sold off or encroached upon: between 1967 and 2001, the Chowmahalla shrunk from 54 acres to 12, as courtyard after courtyard, ballrooms and whole stable blocks, and even the famous mile-long banqueting hall, were all acquired by real estate developers, who demolished the 18th century buildings and erected concrete apartments in their place. In 1997, when I first visited Hyderabad in the course of the research for my book White Mughals, the loot of the Nizam's property was nearly complete. One day I visited the huge Victorian pile of the Falaknuma Palace, just to the south of the city. The entire complex, which lay above the town on its own Acropolis, was empty and semi-ruinous, with every window and doorway sealed by red wax. Wiping the windows, I could see cobwebs the size of bedsheets hanging from the corners of the rooms. The skeletons of outsized Victorian sofas and armchairs lay dotted around the parquet floors, their chintz entirely eaten away by white ants, so that all that remained were the wooden frame and the springs. Ring of old: View from Afzal Mahal. Straight ahead is Taniyat Mahal, now the archive. In 2001, I happened to be on another research trip to Hyderabad when I received a phone call from a friend. 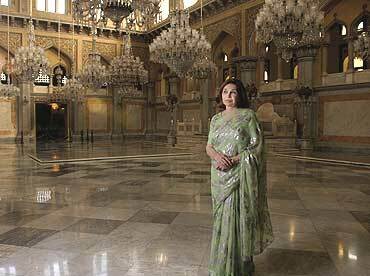 The Nizam's first wife, Princess Esra, had unexpectedly appeared in the city after an absence of three decades. With her, she had brought the celebrated Delhi lawyer, Vijay Shankardass. According to my friend, Esra had recently met her ex-husband for the first time in 30 years at the wedding of their son Azmet in London. She was shocked to hear the state of Jah's affairs: to meet his debts, he had been forced to sell off his sheep farm, and to flee his creditors, he had relocated to a two-room flat in Antalya in southern Turkey. A partial reconciliation followed and Jah gave Esra the authority to try and save something for their son and daughter before what little remained in Hyderabad disappeared too. Among her initiatives, she was intent on settling the many outstanding law cases, and turning the principal city palace, Chowmahalla, into a museum. Begun in 1751, Chowmahalla was one of the finest royal residences in India and a central location for White Mughals, but I had never been able to get inside to see it. After some negotiation, I was allowed to accompany the princess as she visited, and so happened to be there at the breaking of the seals of some rooms which had not been opened since the death of the previous Nizam in 1967. What we saw was extraordinary. After Jah had decamped to Australia, much of his property had been left untouched, as if in the palace of Sleeping Beauty. The jewels and most easily lifted art treasures had long gone—in some cases, the empty silk-lined jewel cases still lay scattered along the corridors—but many less easily purloined treasures remained. In one underground storeroom, thousands of medieval scimitars, swords, helmets, maces, daggers, archery equipment and suits of armour lay rusted into a single metallic mass on a line of trestle tables. In another lay album after album of around 8,000 Victorian and Edwardian photographs of the Nizam's household, covered in a thick cladding of dust. An entire and unique set of 160 harem photographs dating from 1915 lay loose in a box. On the walls, dynastic portraits were falling out of their frames. In one room were great mountains of princely dresses, patkas, chaugoshia and Kanchipuram silks, as well as one huge trunk containing nothing but bow ties. Elsewhere were discovered almost 8,000 mostly incomplete dinner services, one of which alone had 2,600 pieces. In a different palace, King Kothi, were found three rooms stacked floor to ceiling full of the Nizam dynasty's complete correspondence since the mid-18th century. When the archivists had been sacked in 1972, the entire archive had been stuffed into the rooms and sealed: ten-and-a-half tonnes of tatty, disordered and uncatalogued historical documents. Other rooms were stacked equally high with crates of French champagne—now undrinkable. It looked a complete mess that day; an impossible task to even begin to sort out. Every one of the palaces was riddled with termites and white ants: sprung floors were rotting; ceilings collapsing, furniture falling apart. Nothing had been painted or maintained for over 30 years. Yet remarkably, six years later, the Chowmahalla is now open to the public and a thousand visitors a day are streaming through. A massive conservation project, unique in India, has sorted through, catalogued and restored the best of what remains. The result is little short of incredible. In the story of how the Nizam's inheritance was saved, Princess Esra's lawyer, Vijay Shankardass, plays the most extraordinary role. 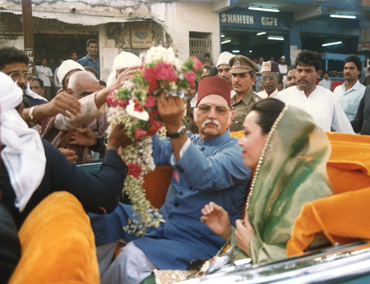 "I was contacted by Princess Esra's lawyers in England," he told me, "and asked if I could intervene in trying to sort out the jewellery trusts which the last Nizam had set up. As soon as the English lawyer had briefed me and told me that there were currently around 2,740 claimants to the proceeds of the 51 jewellery trusts, I said, 'No way—it sounds like a snake pit.' No other Indian royal family had this level of financial chaos, and what I had heard about the Nizam himself did not create much confidence. But the lawyer urged me to meet Esra, so I went to see her in her London flat in Eaton Square. I thought she was a remarkable woman—upright, straight, clear-headed and trustworthy. So, I agreed to help." It was Shankardass's amazing achievement to persuade all 2,740 claimants—legitimate and illegitimate descendants of the different Nizams—to agree to a settlement of the jewel issue, and gradually to whittle down the demands that initially amounted to six times the market value of the jewels, to something manageable. With the backing of all the different claimants, he then had to reach an agreement on a sale price with the Indian government which had, at the last moment, banned the export and auction of the jewels which they rightly regarded as a national treasure. In the end, the government agreed to pay around £40 million—less than a quarter of the market value, but much more than anyone had expected the government to offer. Of this, just under half was to go to the Nizam. Once the jewel money had been sorted out, Shankardass moved on to pay off, or reach some sort of compromise with, the different litigants in the 130-odd legal cases still outstanding against the Nizam. He also settled his remaining debts, then at around £3 million. All this still left a considerable fund for Princess Esra to invest in the restoration and conservation of the Nizam's properties. To supervise the restoration of Chowmahalla she chose Martand Singh, one of the founders of INTACH. "The first time I saw the state the palace was in I thought it would be impossible to save," remembers Singh. "I really thought it was hopeless—totally unsaveable. But when our architect, Rahul Mehrotra, made his initial report, we found that most of the decay was actually cosmetic. The engineering was sound, and despite the rising damp, the roofs were more or less intact. From the first, Esra was completely positive. She asked, 'How long is this going to take?' 'Three-four years,' she was told. 'Too long,' she replied. 'I want it done in two.' And Rahul succeeded—in two-and-a-half." 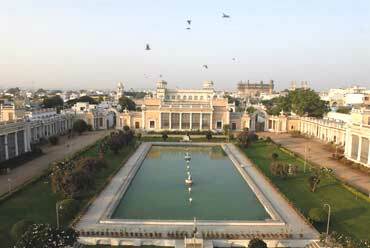 The first task was to restore an old service wing of the palace, which was turned into a scholar's retreat, where architects, urban designers, art and ceramic consultants, conservators, specialist carpenters, photographic experts, textile restorers, antique upholsterers, historians and Urdu and Persian scholars could be lodged and fed while they worked on the different collections. A conservation laboratory and museum store area followed. By 2002, the largest team of conservators ever employed on an Indian restoration project was at work, cataloguing, making inventories, and busily restoring the different collections for the recent grand opening of the Chowmahalla palace to the public. Meanwhile, the conservation of the remaining buildings continues. The restoration of the Indo-Saracenic Khilwat Mahal—where state coronations were carried out—is now complete, and today houses the arms and the photographic collections. The restoration of another of the Chowmahalla pavilions—the Afzal Mahal—is currently under way, with a team of Austrian carpenters at work on the woodwork. The plan is to use the buildings for concerts, mushairas and conferences, so turning the complex into a cultural centre as well as a museum. The Nizam's vast archives are still in the process of being catalogued: 15 Urdu and Persian scholars are currently employed full-time to sift through the material. Already they have stumbled across a major historical discovery: the negotiations which the Nizam conducted throughout the early 1940s with the Portuguese to buy Goa and so provide his state with a port, and with it a real hope—never realised, thankfully—of remaining independent from India once the British finally quit India. Lth, Princess Esra returned to Hyderabad from her base on an island off Istanbul to oversee the progress of her conservation efforts. Her tour of inspection completed, I asked if, looking back, she had any regrets. "Many," she said. "If I had the head on my shoulders that I have now a few years ago I would never have let things get into the state they did. But I was too young." "He had a brilliant brain when I met him," she said. "But partly because of his diabetes he went into decline, and in the end really, well...disintegrated. Today he keeps to himself in the south of Turkey. Lives very simply, doesn't love extravagance. Lives in a two room flat in Antalya, and spends his time reading and exploring Roman ruins, going swimming in summer..."
Now Esra's reserved 47-year-old son Azmet hopes to come back to Hyderabad and take on what remains of the family role in the city. Until recently a Hollywood-based cameraman, this great grandson of the last Ottoman Caliph—and so the most senior claimant to inherit the Caliphate—has worked with Steven Spielberg and Richard Attenborough and was even responsible for helping shoot the notorious Sharon Stone starrer, Basic Instinct, not something bin Laden seems to be aware of when he calls for the restoration of the Caliphate. "I am planning to spend much more time here," Azmet told me. "The death threats and lawsuits that kept us all away are cleared up now, and I have great affection for this place—I grew up here." He paused: "I am determined to maintain what has been saved. We'll not make the same mistakes again." This is an abridged version of an article published recently in The Guardian. William Dalrymple is the author The Last Mughal: The Fall of a Dynasty, Delhi, 1857 [Penguin India] which recently won the Duff Cooper Prize for history.